Your Christmas dinner doesn’t have to be a complex process. If you already have a full morning planned on Christmas day, make life easier for yourself and keep the cooking simple. A Christmas day lunch is traditionally a big feast, so choosing a carefully planned menu will help you make the most of spending time with your loved ones whilst cooking up a storm. Don’t spread yourself too thinly with an enormous menu, instead, focus on cooking just what you need, and cooking it well. The trimmings might be the best bit of Christmas day lunch, but don’t overdo it. If you’ve got your heart set on cooking sprouts, but your family are not big fans, try a new way of cooking them. A bit of pancetta and a handful of chestnuts completely transform the flavour of the humble sprout. If, by Christmas day, you’ve eaten more than your fair share of turkey, why not try something different this year, like goose or venison? Whatever you plan to cook, if you follow these steps to planning and preparing your meal you are guaranteed a Christmas feast to be proud of. Buy your meat well in advance, whether that means ordering from the butcher or buying a frozen turkey, giving yourself enough time to plan how to prepare & cook your meat means less stress on the day. Give your fridge a thorough clean, and empty out anything you don’t need to make sure you have enough space for all the Christmas food. Sharpen your knives, and ensure you’re stocked up on kitchen basics like tin foil before the big day. Especially extra-large foil for your turkey! Save yourself time and spare yourself a pile of washing up by using disposable foil trays for roasting. If you have a frozen turkey, make sure you get it out of the freezer, at least a day before Christmas. A turkey that’s still frozen in the middle will not cook properly and will take the edge off your Christmas cheer. This is your last chance to double or triple check that you have everything while the shops are still open. 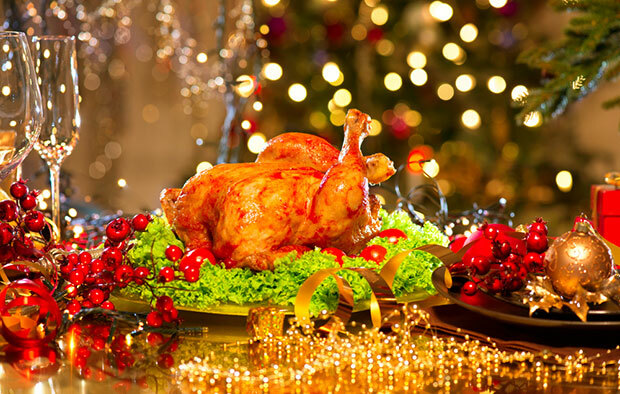 Complete all the preparation you can today, the aim is for Christmas day to be as easy as possible. Prep the vegetables the night before. Set aside an hour on Christmas Eve to peel the potatoes, trim the sprouts and get the rest of the veg ready to go. That is an hour you’ll not spend on Christmas morning doing it. Parsnips and potatoes can be stored in pots of water overnight to prevent browning. Unlike turkey, roast vegetables turn out best when cooked at high heat. That is the beauty of a Leisure cooker; your turkey can be slowly roasting away while, thanks to the second oven, you can crisp up your roast potatoes no problem. Christmas Eve is also the time to make your cranberry sauce, mixing all the ingredients together on Christmas Eve gives them a chance to mingle and develop. It is easy to make from scratch and tastes much better than out of a jar. If you are also making your gravy from scratch, this can be made today as well. One last thing to remember today is to check the weight of your turkey. This will give you a good idea of how long it will take to cook. If you are cooking your stuffing inside the turkey, remember to weigh the bird after it has been stuffed. Advice from the British Turkey Information Service states that if the bird is over 4kg, cook for 20 minutes per kg and then add 90 minutes. If your turkey is under 4kg, cook for 20 minutes per kg, then add 70 minutes. You can ensure your bird is cooked through by piercing the thigh and checking the juices run clear, if not put in back in the oven for 20 minutes and then test again. Make sure you take anything frozen out of the freezer so that it has time to thaw. Make sure the drinks are chilled ready for the big day. If your fridge is full to bursting, they can be left outside to chill. Don't forget to leave a treat for Santa and his reindeer – the little ones can help here, too. Christmas morning: it's time to tackle the turkey! The first thing to do is remove your meat from the fridge and allow it to come to room temperature. Don’t forget this step, a cold cut of meat will take longer to cook and could delay the rest of your meal, just ensure you don’t leave it out for any longer than 2 hours so that the meat doesn’t go bad. You should have all your timings worked out by now, and with a Leisure range cooker, it’s a breeze cooking everything at once with minimum fuss. Once your meat is cooked, don’t forget to rest it. Whether it is a traditional turkey or a joint of venison, resting allows the meat to reabsorb all the juices and leaves your meat much tenderer. Now all that’s left to do is serve up, pull a cracker, raise a toast and tuck in.